Nokia’s Lumia smartphone range has made progress this year — particularly in Europe, where it has even overtaken iOS marketshare in some countries — and lower-priced devices continue to be the sweetest spot for the Finnish company, as new figures from AdDuplex show. 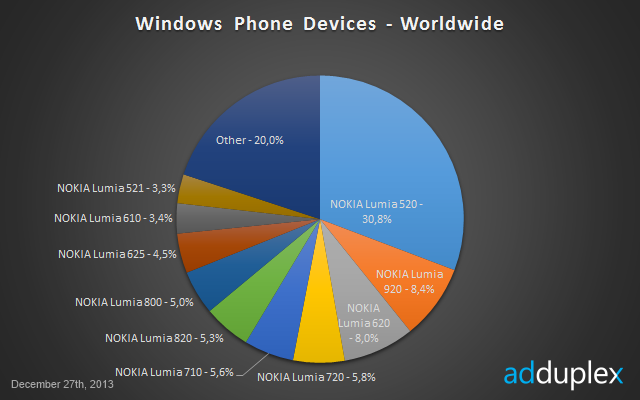 AdDuplex, a popular ad network for Windows Phone which tallies data from 2,499 Windows Phone apps, claims that the $180 Lumia 520 now accounts for over 30 percent of all Windows Phone devices worldwide, though that figure rises to 34 percent if you include the Lumia 521, its close sibling. Those figures are up from 26.5 percent and 29.4 percent last month, respectively, and 13 percent back in July. Nokia announced the Lumia 525, an upgraded version of the Lumia 520, in November, and it will be interesting to see how the device — and the older two — perform in 2014, particularly after Microsoft completes its acquisition of Nokia’s device business. More holistic data of the Windows Phone ecosystem shows that Nokia’s share of total devices has risen to 92.1 percent from 90 percent in November (second-placed HTC owns just 5.2 percent of the market). The rate of Windows Phone 8 installations crept up from 75.3 percent to 78.3 percent, a trend that will help lessen usage of the older Windows Phone 7 platform.